Table Talk with C and C: Fantastic Giveaways and Under Construction . . . Fantastic Giveaways and Under Construction . . .
We are working on updating the look and layout of our blog so please bear with us!! We're trying out some different layouts to see what we like best and of course some of our previous widgets aren't cooperating and don't look quite right. We hope to have it all worked out soon!! But in the meantime, please be sure to enter our 100 follower giveaway if you haven't already! There are only 2 days left and it's full of amazing prizes!! We are also participating in some other fabulous bloggers giveaways. Be sure to head on over to Tori's Teacher Tips for her 800 Follower Giveaway. 800 Followers - AMAZING!! We hope to reach that many teachers someday! 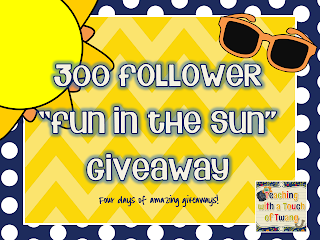 And Teaching with a Touch of Twang is having a 300 Follower Giveaway!! Be sure to check out Day 1 and Day 2 of her giveaway! Also, stop on over at Head Over Heels for Joanne's 300 follower give away!! She has 30+ bloggers and 40+ prizes to give away!! Her gave away is broken down from teacher bloggers grades 3-6 and K-2!! Head on over there for some more great prizes! We didn't get a chance to post our Sunny Summer Days Linky Party, but we will have that up next week, so be sure to check back! We hope everyone is having a relaxing and fun summer!! Thanks Brittani! We are really loving our "chevron" look now! Your blog is adorable!! Love the bees! Super cute! !